AR-15Spring Predators: Ethical or Not? Spring Predators: Ethical or Not? When the temperature rises and the coyote have young, should you be hunting? First, I am a western hunter. I live, travel, and hunt over a big slice of country from the Rocky Mountains to the Pacific, and have for over four decades. I consider coyote, bobcat, and fox game animals. They’re an important part of the overall wildlife picture. I would also point out that the west holds more of these three predators plus mountain lions and bear, than any other region in the continental United States. Daily sighting of predators are a common occurrence. Coyote, bobcat, and fox live and thrive in close proximity to man and his communities, and sometimes these “communities” can literally be a metropolis. Even mountain lion and bear are becoming more visible in recent years because of growing populations. The big cats, secretive as they are, are not only living close to farms, ranches, and towns, but stalking and attacking children and adults, sometimes killing and partially eating their victims on jogging or bicycle trails, and in the West’s most populated state — California. Recently in Sherwood Oregon, local coyote made national news when they became so bold as to come into town and chase a 15-year-old high school sophomore home. They were so close he kicked at them as he ran. “We don’t want people to panic, to think coyotes are on the rampage.” Police Sergeant Dwight Onchi, said. “We just want them to know that if you see one, tell us, and we’ll do our best to take care of it safely and humanely.” He then added that his officers would use AR-15 rifles carried in their patrol cars. In California, 281 attacks by coyote on people were reported in 2003, but attacks have been reported across the country. Las Vegas, Nev.; Scottsdale, Ariz.; Durango, Colo.; Tulsa, Okla.; St. Louis, Mo. ; Eastham, Mass. ; and Greenwich, Conn., have all reported the same thing. Coyote/human/pet encounters have increased dramatically since the late 1980’s. Why? Because coyote numbers have increased and they have lost their fear of humans who don’t harass them in urban settings. The days of “predator control,” by western big-game departments are history and have been for nearly three decades. They don’t have the money, staff, or field people. Only predator hunters like us now fill that role, and when population control is the objective, spring is the best time to get it done. These same big game agencies have little to no information on real numbers of depredation on popular big game animals like mule deer, blacktail deer, or elk taken by coyote, bobcat, fox, lion, or bear. However, one set of numbers can be verified, and that’s the steep decline of mule deer in so many areas across the west. This decline began at the same time state game departments ended their efforts at predator control and predator populations began to increase. Is it possible that these two events have something to do with each other? Predator populations aren’t declining. In fact, the opposite is true and anyone who lives west of the Rockies is well aware of it. Spring hunting, especially on coyote, isn’t only ethical but vital. In most states, bobcat, fox, mountain lion, and bear are controlled under tag limits and seasons. I do not suggest spring hunting is necessary for them, although the ban on hunting lions in California has been nothing short of a disaster and its full effects are yet to be seen in that state. The predator hunter who goes out in spring will find it to be one of the very best times of the entire year for success. 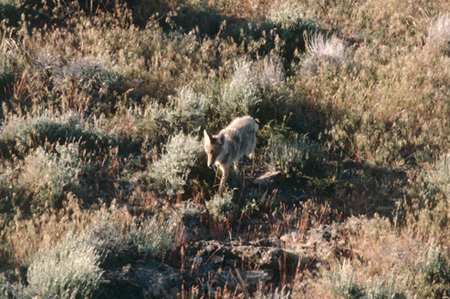 Coyotes are highly active, traveling widely in search of feeding opportunities. After a long, cold winter, the “dinner bell,” is being rung, and loudly. That means both males and females are hunting hard. It also means calling can be just as productive at high noon as it is early or late in the day, another very big plus in your favor. Set up where you have an expansive view of the country around you if possible. In high country, if snow still lingers, set up just below the snow line, not in it. Look for any rise, saddle or cliff edge that offers you elevated concealment with a big view. In heavy cover or where the land is chopped up and vision is limited, get elevation by climbing a tree. I use tree stands, and in heavy cover you’ll be glad you did. Nothing gets the blood flowing like making a ground stand in thick cover and having a coyote or bobcat pop up 10 feet away. Another key to successful spring hunting is to make your time on stands a good deal longer than you normally would. Fifteen minute stands or slightly longer are pretty standard in most of the country. Stretch spring stands out to 25 or even 30 minutes. Over expansive country animals can hear a call amazing distances and come a long ways to them. Exercise the patience to give them the chance to do both. Plan to cover a lot of ground, making many stands throughout the day. Predators are traveling widely at this time, so should you. The distance between stands is governed by the lay of the land. Hilly, chopped up country means stands can be made much closer together because your calls won’t get out as far. In open country, try moving between 2 and 3 miles for each set-up. This way you’ll get good overlap and not miss reaching predators either moving through, or those that live there. Spring predator hunting can be the most successful time of the year to kill coyote. In the final analysis, this decision must be made by each and every one of us individually. 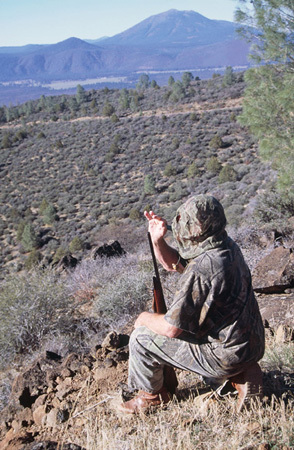 From a Westerner’s point of view, I’ve made the case for spring hunting and my reasons for it — controlling over populated numbers of coyote. If controlling excessive coyote numbers is your goal, I say hunt spring, hunt hard, and enjoy this most glorious time of the year to be out pursuing our sport.